More than 168 Kroger stores throughout Georgia are participating in the Georgia Department of Agriculture’s “Milk Makes Amazing” promotion. The campaign is part of the ag department’s Georgia Grown program. Driven by Milk on My Mind, a dairy awareness program initiated by the Georgia Agriculture Commodity Commission for Milk, the partnership with Kroger educates consumers about the benefits and versatility of milk and dairy foods. Kroger customers will see Georgia Grown milk and dairy products showcased in-store and with digital advertising. Recipes and videos from local chefs demonstrate easy dishes using Georgia Grown dairy products. 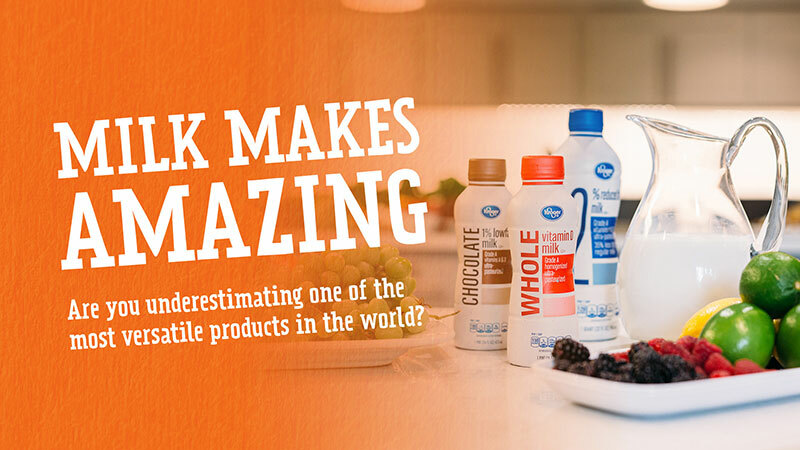 The videos will appear on popular social media platforms under the tagline: Milk Makes Amazing, #MilkMakesAmazing. A special ceremony to kick off the Milk Makes Amazing campaign was scheduled for Saturday, March 16, at 10 a.m. at the Kroger at 10945 State Bridge Road in Alpharetta. Commissioner Black was to deliver the opening remarks. Event activities included a visit from the Georgia Mobile Dairy Classroom, live cooking and tasting demonstrations by Kroger’s Chef John, Georgia Grown’s Senior Executive Chef Holly, Word of Mouth Restaurant’s Chef Stephen and Private Chef Massimo, a live radio remote with B98.5 personality Charley Morgan, in-store Kroger Chef Junior Cooking classes, and prizes and giveaways, including Groceries on Us Kroger Gift Cards. Milk on My Mind was developed by The Partnership on behalf of Georgia Dairy Farmers. The Milk Makes Amazing campaign is a collaboration between Georgia ACCM, Kroger and Georgia Grown. For more information about the program, or to watch the videos and download the recipes, visit the Milk Makes Amazing website. The Georgia Grown program provides a new branding tool, education, marketing and business connections to expand agribusinesses and the agricultural industry throughout Georgia.